Washington: A Chinese fighter plane has been spotted on a Chinese-held island in the South China Sea, the first such sighting in a year and the first since US President Trump took office, a US think tank reported on Thursday. 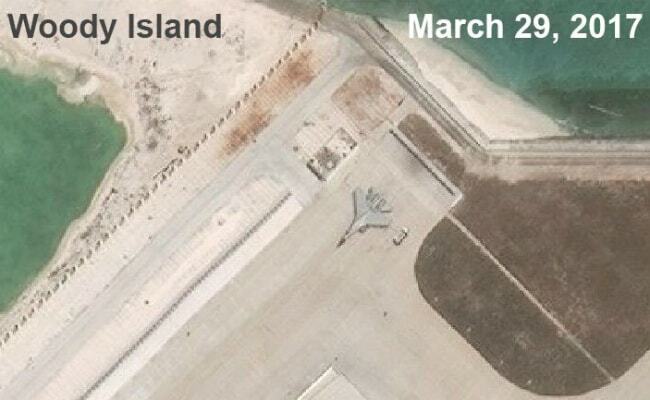 The Asia Maritime Transparency Initiative (AMTI), part of Washington's Centre for Strategic and International Studies, said the J-11 fighter was visible in a satellite image taken on March 29 of Woody Island in the Paracel island chain. News of the sighting came as Trump was in Florida for meetings with China's President Xi Jinping on Thursday and Friday at which he is expected to air US concerns about China's pursuit of territory and militarization of outposts in the South China Sea. "This isn't a first, but it's the first time in a year," AMTI director Greg Poling said of the jet sighting. Referring to the single fighter plane visible in the image, he said: "There are likely more in the hangars nearby." Poling said it was unclear how long the plane had been there, but added that similar deployments on artificial islands China has built further south in the South China Sea's Spratly archipelago could be expected now that military facilities had been completed there. deployments of Chinese fighter jets to Woody Island were part of a disturbing trend of militarization that raised questions about Beijing's intentions in the South China Sea, which is an important trade route. The Chinese embassy did not respond to a request for comment. China has previously rejected US charges that it is militarising the South China Sea, and in March, Premier Li Keqiang said defence equipment had been placed on islands in the disputed waterway to maintain "freedom of navigation." A US official, who spoke on condition of anonymity, said the presence of a fighter aircraft on Woody Island was not something unexpected. "It is already heavily militarised; no surprise we would be seeing military aircraft there," the official said. Earlier on Thursday, Philippine President Rodrigo Duterte said he had ordered troops to occupy uninhabited islands and shoals it claims in the South China Sea, something likely to anger China, which claims most of the strategic waterway.